December 2014 – Here there Be Dragons! This is the last full week of December and, as such, the last of my scheduled short stories. I will continue writing them, and posting them, but with the ‘regularity’ (HA!) of this schedule. I hope you will enjoy them all the same, or more so, in their new randomness. Here is my big finale – a little look at a slice of a very important day in one girl’s life. The year was 1943, the man was a fedora sporting dark eyed, people watcher, and the car was a coupe. That was all the picture had to offer for the thirsty eyes of the young lady who had found it buried in a dusty box. One memento, carefully packed away using the old ‘box in a box wrapped in a blanket, under junk in another box’ trick. Good thing she was tenacious (or stubborn as her Mother always asserted), otherwise she would have given up hours ago. But the only thing Corinna ever gave up on was cleaning the house! And so began the telling of Corinna’s family history, of love and duty, of loyalty and disruption, and of running from a war that had nothing to do with external forces. Through it all Corinna’s mother, who had gone by the Bea for the past sixteen years, leaned against her daughter’s closed bedroom door and listened as silent tears poured from her eyes. Maybe it was time to stop running and finally turn to face their swiftly approaching past. All 5 of my currently available works, including the 3 Stone Dragon Saga Novels, are FREE for download on the Kindle App this weekend. Check them out at my author’s page, amazon.com/author/elizabethtyree , and please feel free to share with your own followers! I’ve given a few away in other countries but would LOVE to see someone in all available markets grab a free book! After all, it is FREE! That link there ^ will take you to my Amazon.com author’s page. There you will find links to all FIVE of my books, all of which will be free for download on the Kindle App from midnight tonight through Monday. Happy weekend everyone! This mostly stand alone short has now become an integrated, and integral, part of Dragons in the Deep. Even if you don’t know anything about The Stone Dragon Saga this story should intrigue and delight you! Whatever your response, please let me know! I cherish feedback from peers and/or fans (are you any of you fans? I never find fans…sigh). “NO! I—I can’t!” Anna stubbornly responded, slamming books around for good measure. “Remember Franme’s parting shot?” Anna sighed defeatedly, knowing that Jane would never stop hounding her. From April 27th of this past year, The Legend of the Castillian Dragons is a short story that clears up some backstory for my Stone Dragon Saga book 4: Dragons in the Deep. I love this story and hope that you enjoy it too! In the year 1277, during the civil war for his throne, King Alfonso X of Castile located a secret room in his home. In this secret room was a staircase, at the bottom of the staircase a tunnel. The tunnel wound deep underground, the air cool and musty as secrets. The cool air and winding tunnel took him to a large, well-fortified, and long forgotten vault carrying the secret symbol of a monarch. Happy Christmas All! (whether you celebrate or not). Today is a day of happiness and togetherness with my family and hopefully for yours as well. One thing that makes me very happy is my inner world in which reside several character, many of which are dragons. So from The Stone Dragons and myself, Have a Merry and Safe Holiday Season and enjoy these three favorite images. Santa’s reindeer seem to have evolved, or taken an eggnog break! This picture from NOUpe.com is one of my favorite! 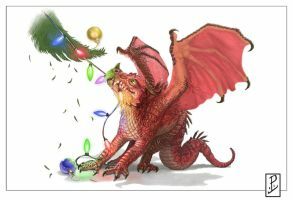 Finally, this deviant art picture shows exactly how I feel the Dragons of the Stone Dragon Saga would behave on Christmas…like small children/cats trying to figure out how everything worked! I love the symbolism of an anchor and that love has only grown over the past year and a half as I researched and began writing my 4th Stone Dragon Saga novel (Dragons in the Deep). As I continue to not only research marine symbols, but also art, quotes, and whatever else I can get my little hands on, I keep coming across tattoos. I love tattoos when done “correctly” (to my mind at least). What I mean by that is that I believe that tattoos are supremely personal and need to have a longevity that will probably not peter out when you hit a certain age. I have two such tats and one that I keep finding (on Pinterest of course) that holds a certain level of meaning is that of the anchor and quote ‘I refuse to sink’. We’ve all been through something(s) that make us think “I’ll never go there again!” or “I’ll never be that low again!” or “I will never go back there again!” and to me ‘I refuse to sink’ is a great reminder that you didn’t sink then and you won’t sink now. You are stronger than all of that, don’t go back! I suppose that, for now at least, I should probably just focus on actually WRITING the books and worry about designs later…although this might also make a great canvas to hang up in the Loft, or part of the back cover…hmm. Now where did I put that illustrator at? Short Story Sunday. I really like this one, what do you think? Sitting in a long line of traffic, going 10 miles below the posted speed regulations, with drooping eyelids and blasting stereos, no one expected any variation from this daily trek into work. George Edward Allan, an 81 year old man with a grouchy sense of humor and an out of date driver’s license, was returning home from his own daily outing to the local diner and found himself staring at a golden opportunity. Clutching his ‘to-go’ coffee tightly in an arthritic old hand and waiting for a slight break in the line (he wouldn’t want anyone hurt after all), Mr. Allan swerved into oncoming traffic. Chuckling to himself as the poor little girl in the ‘smart car’ (SMART CAR, HUMPH!) scrambled to avoid the 1953 steel frame Chevy that had barreled toward her.